This month I participated in a Foodie Pen Pal through the Lean Green Bean. 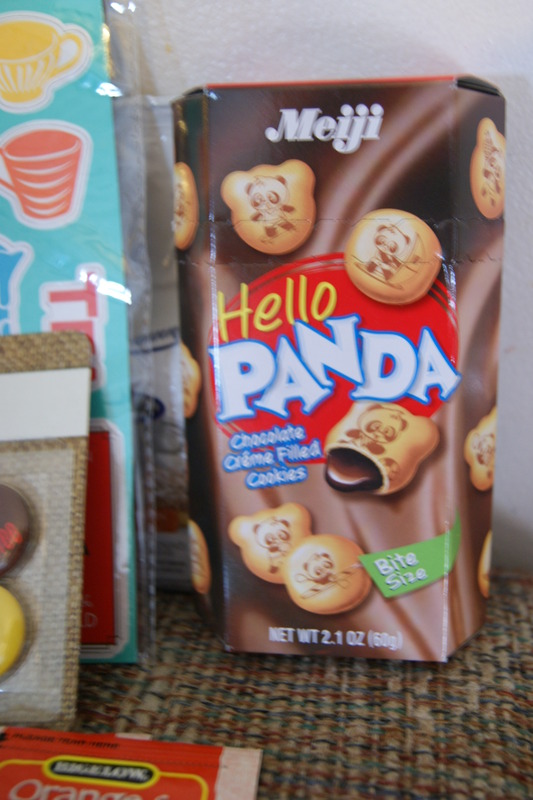 You are given a name of a person you buy goodies. Then you mail it. 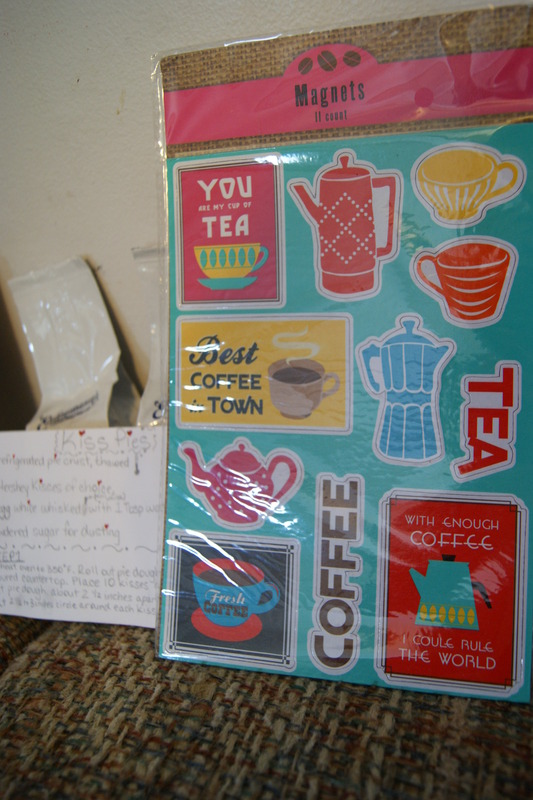 Another person gets your name and they buy you goodies and mail it to you. There is a spending limit of $15. Lindsey, the coordinator, is very organized and has specific directions. I was paired up with Robin and Shania. 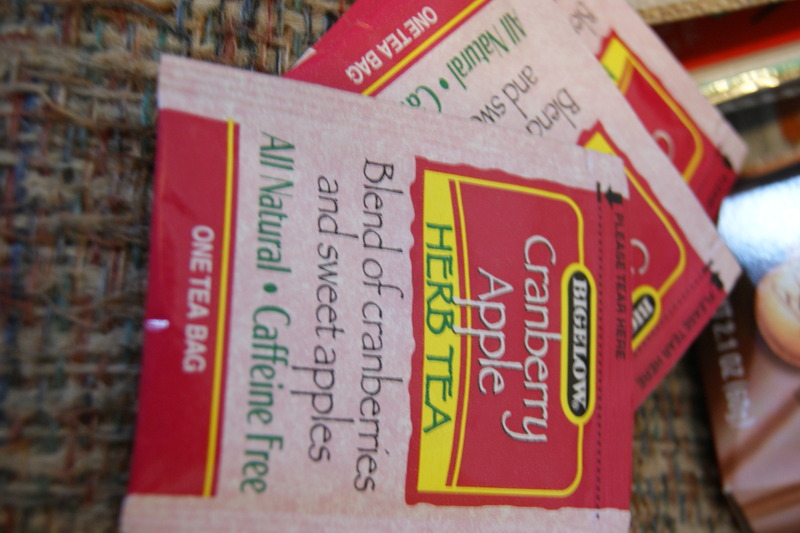 For information on what I sent Robin, visit her blog at Red Robin’s Nest. 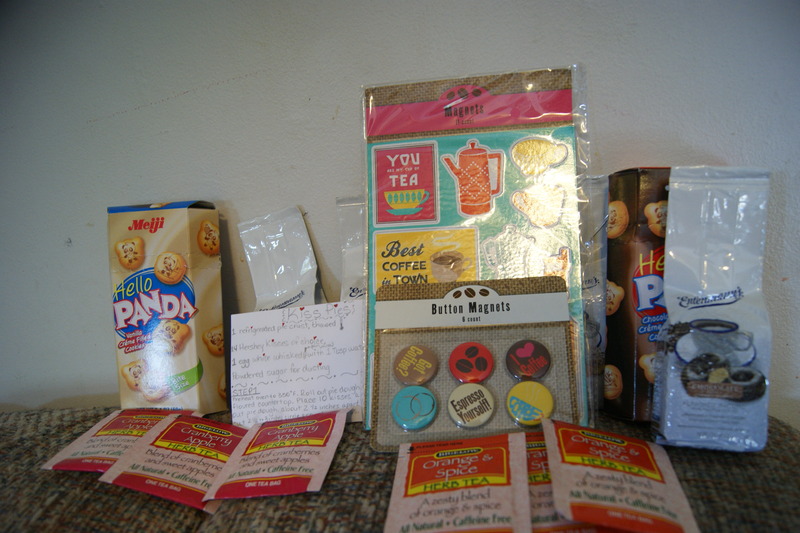 Shania from Eden Flour Patch sent me my foodie care package. Here’s a picture of all the goodies in the box. These cookies look delicious for either a work treat or in my camera bag. When Shania asked me my likes and dislikes, I mentioned coffee – medium or light roast. This coffee is the best of both worlds. 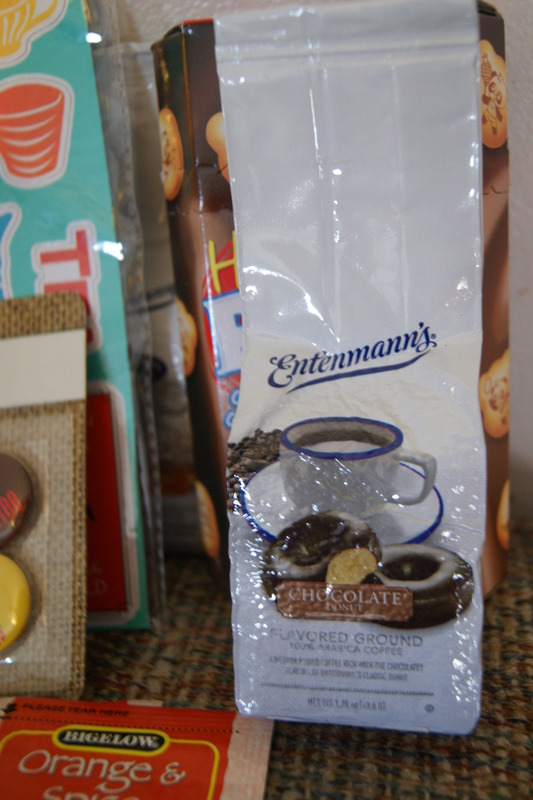 – delicious coffee and Entenmann’s pastry. I get the flavor of the pastry without all of the extra calories. When I make coffee at home, I will either drink it black or with Natural Bliss vanilla creamer. This will be good with that creamer. 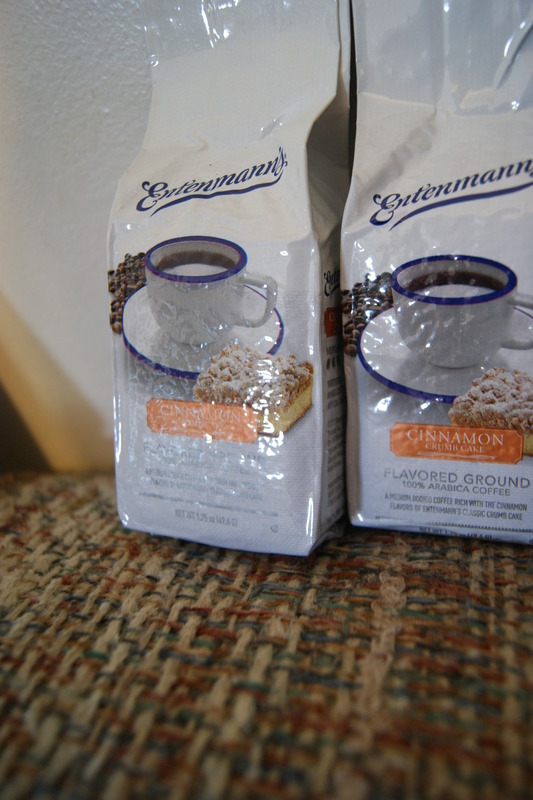 There were 3 different kinds of Entenmann’s coffee – Hazelnut, Chocolate doughnut, and cinnamon pastry. Yum! At work, I have a whole basket of magnets so I can hang things up on the whiteboard. In years past, it’s been a filing system for me. When students need to finish an assignment for their regular class, I will hang it up on the board. It’s so we don’t lose it and so it’s a visual reminder for me. 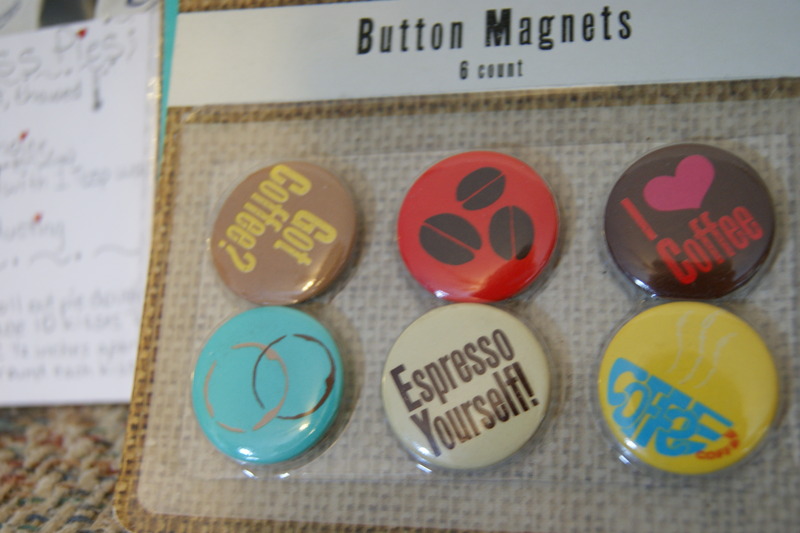 Some of these magnets will go in the magnet basket. Some will go on my fridge. More coffee. After my dinner the night I got the box, I made myself a cup of the coffee. It was super delicious ! 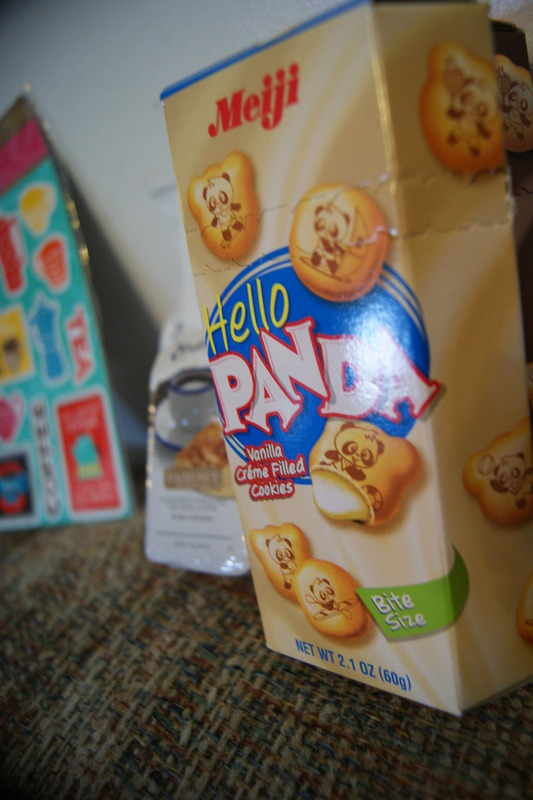 Another box of cookies. This time with chocolate. Yum! 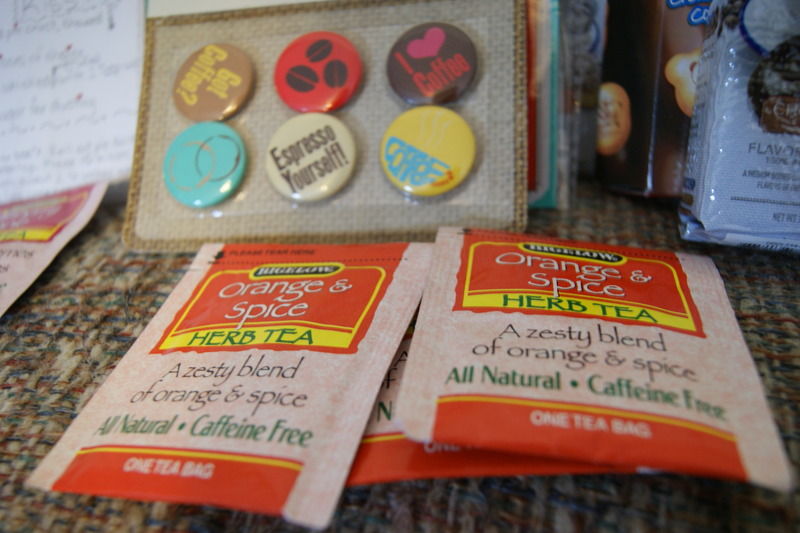 She also sent me some tea bags. Those will be great on cool fall days. Thanks for the great package, Shania. If you are reading my blog and are on Facebook, can you please come on over and like it. Pretty please. I’ve only 38 likes and one of them is my own. 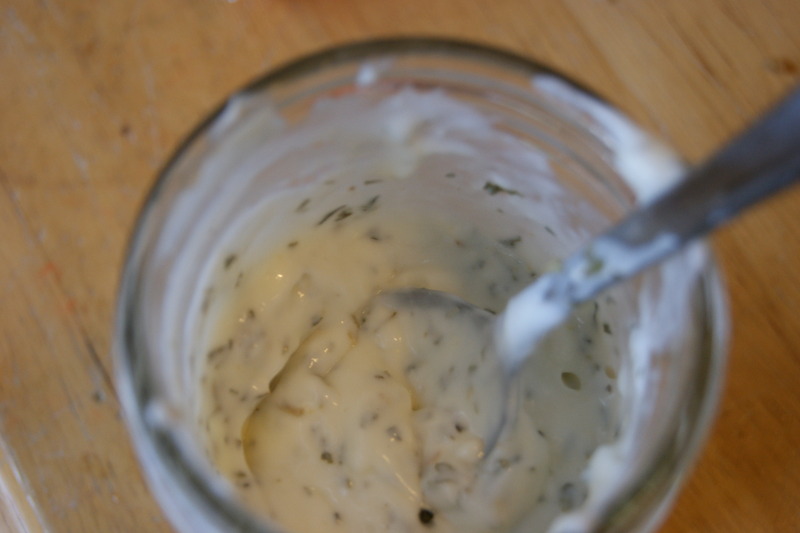 Ranch dressing is always delicious with salad or for dipping raw veggies. 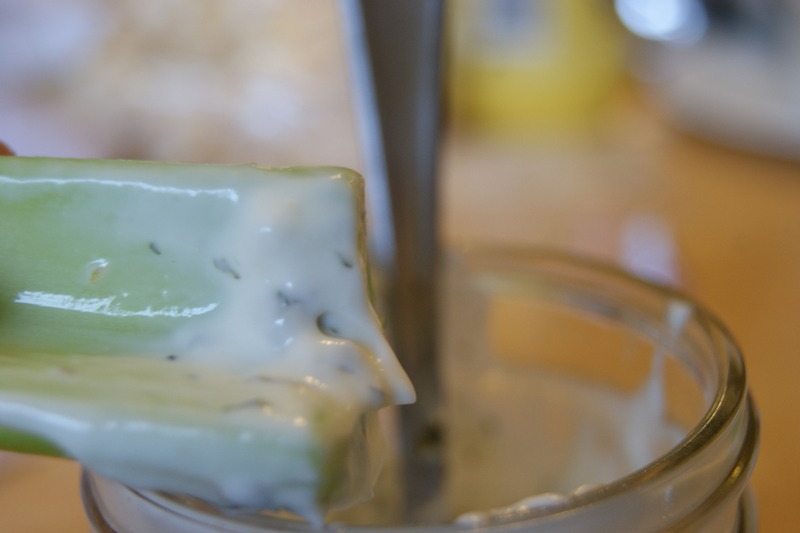 I had written this recipe down a few years ago and decided to make some to dip my celery in. This would be a great Christmas gift. Mix up all the mix ingredients. For the dressing: mix the mayo and milk with 1 Tbsp. of the mix ingredients. One of my favorite blogs is Eat at Home. I’ve been following Tiffany’s blog for the past 2 years. Each week she provides free weekly menus featuring recipes she has posted. The majority of her recipes are fuss free or little fuss recipes. The recipes are also delicious. I got this recipe from the blog. She named it Skillet Chicken with Peppers and Tomatoes. I renamed it Italian chicken because my boys would have told me they didn’t like it because it had peppers and tomatoes. When they did their daily ritual of asking me what was for supper, I told them Italian chicken. I was lucky to find thin chicken breasts on sale when I did my weekly shopping. They were in a family pack for $10 and some change. I was going to be able to use the pack for 3 meals. That is a deal! Even though I told the Imaginative One that I spent a lot on the chicken and he needed to eat all of his serving. LOL! The chicken needs to marinate overnight so plan ahead. Marinade the chicken for at least an hour. Put the olive oil in the skillet. Heat it on med. heat. Add the garlic and onion and pepper mix to the skillet. Cook for a few minutes. Simmer over med. low heat for 10 minutes. Serve with the penne pasta. I love Tim Horton’s. Five years ago, I stopped there almost every day on the way to work. I considered it my half point because it was almost directly in the middle of my drive to work. I would get an iced coffee and almost always get a BELT bagel sandwich. If you are wondering what a BELT bagel sandwich was, the letters stand for bacon, egg, lettuce, and tomato. The sandwich was suppose to have to have cheese on it but I usually opted not to have the cheese on it. Now I don’t stop there as often. When I do, it’s now on my way home from work instead of on the way to work. I usually get the iced coffee or hot coffee and either a cherry cheese danish or a plain bagel toasted with butter. So when I saw a recipe for danishes on Finding Joy in My Kitchen, I knew I needed to try to make it. However I didn’t want the apples on it. So I changed up the recipe to be Cherry Cheese Danishes. Cut in the cream cheese following the same method. Pour in the milk and vanilla. Stir until the dough become clumpy. Divide the dough into 6 parts and shape them into a small circle. Shape the circles so the edges are slightly raised. Place on a greased cookie sheet or line it with parchment paper that has been greased. Combine the cinnamon and sugar in a small bowl. Sprinkle on the crust. Spoon about 3 cherries and the cherry “sauce” on each crust. Bake at 425 minutes for 15 minutes. Reduce the heat to 350 and bake for 3 to 4 minutes. I’ve been slacking at menu planning for the past few weeks. This is bad because I’ve been scrambling around trying to figure out what we were going to have for dinner. This week is a weird week. I have a favorite zoo that I swear the people are going to know by name soon because I’ve gone there at least once a month since April. Well, they offer teacher workshops. The workshops combine some of my favorite things – seeing the animals and photography. They are offering a workshop this week. My school gave me permission to attend the workshop. The workshop is on Friday and Saturday. Since the zoo is about an hour and 15 minutes away, I’m so fortunate because I have a family friend who is allowing me to spend the night at their house. The wife is a pastor and is receiving an award that night. Today I got an invitation to go to the dinner and award ceremony. That is totally cool because I’ve been friends with the family for over 20 years. My husband is going to have to feed the boys on Friday night before he goes to work. Then on Saturday he’s going to bring the boys to the zoo for Boo at the Zoo. So we’ll eat dinner there or on the way home. Okay, peanut butter blossoms will never be totally healthy. First of all they are a cookie and second of all, you put a piece of delicious chocolate on top. However, I made a little bit healthier version of them. The Imaginative One has a list of his favorite cookies. The top three are Snickerdoodles, Chocolate Chip, and Peanut Butter Blossoms. Today I asked the boys if they wanted me to make cookies and if so which kind. They decided I needed to make Peanut Butter Blossoms. Okay, I had Hershey Kisses but they weren’t chocolate. They were pumkin spice flavored. So the Imaginative One and I made a trip over to the local Walgreens to pick up a bag of Hershey Kisses. We went to look for shortening while there and couldn’t find any. When I got home I went looking for substitutions for shortening – butter, cooking spray, lard, and cooking oil are some substitutions you can use. Butter could have worked. Cooking spray and oil were out of the question. I don’t even have any or have ever had lard in my kitchen so that wouldn’t have worked at all. The last choice was applesauce. I’ve used it before so I went with applesauce. instead of using all purpose flour, I used white whole wheat flour. Beat applesauce and peanut butter in large bowl until well blended. Yesterday I made sure I had all the ingredients for 7 up biscuits so we could have them with out dinner. At least I thought I did. Then I looked at the recipe and saw I needed sour cream. Oops! We didn’t have any in the house or if we did it would not be edible and should be given to the trash monster. What to do? raced through my head. I had some Greek yogurt in the fridge so I decided to use that instead. People have been substituting Greek yogurt for sour cream so I thought this would be the time to try it out. The Greek yogurt worked perfectly. The biscuits were as delicious as before. And people didn’t know my little secret. Here is the recipe updated with Greek yogurt. Meanwhile put a 9 inch square pan into the oven to melt the butter. Pull the pan out of the oven and put the cut biscuits in the pan. I love granola especially when I make it myself. Recently I discovered how it is easy it is to make. I’ve made Apple Crisp Granola and now Pumpkin Granola. It’s wonderful with Greek yogurt. Mix the oats, rice krispies, coconut, and pumpkin seeds together in a large bowl. In a different bowl, combine the applesauce, sugar, maple syrup, and vanilla. Add the pumpkin puree. Combine the dry and moist ingredients and stir to coat. Spread on a cookie sheet sprayed with cooking spray. Bake at 350 for 30 minutes. Stir after 15 minutes. Allow to cool and then add Craisins. Enjoy with yogurt, milk, or by itself! This post has been linked to Eat at Home – Ingredient Spotlight. This is an easy alternative to traditional puppy chow. It calls for Biscoff which is the same as Trader Joe’s Cookie Butter. Biscoff and Cookie Butter tastes like cinnamon graham crackers. And is delicious with honey wheat pretzel sticks. So this snack mix tastes sort of like S’Mores especially if you add in marshmallows. Yum! Add ins: – I used mini marshmallows and mini M&M’s. You can use whatever you want! Put cereal in a large bowl and put to the side. In a small microwave-safe bowl, melt the chocolate chips and Biscoff. Start with 30 seconds, stir, then heat in 15 second increments until melted. Pour melted chocolate mixture over the cereal. Stir gently to coat all the pieces of cereal. Add 3/4 c. brownie mix to a large ziploc bag, dump the chocolate covered cereal into the bag, and shake to coat all the pieces of cereal. Spread onto a large baking sheet until dry. Once it is dry, add in the mix-ins. Put in a container to store.